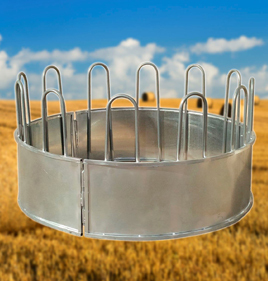 Whether you’re looking for a square or round hay bale feeder for horses or you need a large square live stock feeder for silage on your farm, Ace Equipment has you covered with a broad selection of high-quality farm hay feeders and hay bale feeders to choose from. 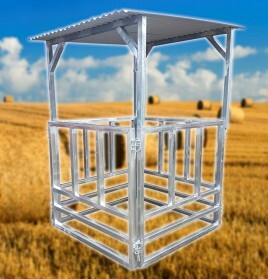 Constructed from galvanised steel for all-weather protection, all of the farm feeders we have for sale come complete with the necessary heavy duty gal pins and drop pins for installation. They’re also easy to store and install, making them suitable for a wide range of livestock environments and ideal for both hay and silage. Keep wastage down to a minimum when it comes time for your cows or horses to feed with hay bale feeders from Ace Equipment. The hay square or round bale feeder is available in a range of different sizes to accommodate the various silage or hay bale sizes used on agricultural land. 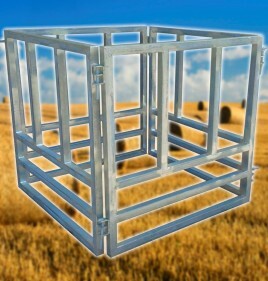 Manufactured from the finest galvanised steel, the hay bale feeders we have for sale have been designed to withstand the harshest Australian climatic conditions. Your livestock will be suitably nourished when you come to us for your hay bale feeding requirements. 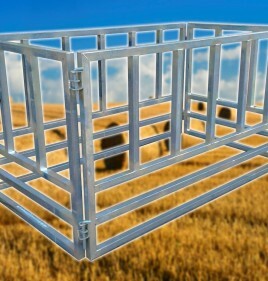 Easy to assemble and disassemble when needed, the hay feeders we have for sale provide a sturdy solution for all kinds of Australian farms. Whether you’re a hobby farmer or have a full commercial operation in place, discover how we can help you. WHY USE A ROUND HAY BALE FEEDER FOR HORSES? The round hay bale feeder for horses is typically used to feed horses located in poor pastures where they can’t get their nutrients naturally, as well as during the winter months. Round hay feeders and silage feeders are typically most suitable for use with horses, as the cost of storage is about the same as that of a small square hay bale feeder. For a round bale feeder to be truly cost-effective, however, you’ll need a half a dozen horses – if not more – situated around the feeder and all of them eating reasonably quickly. If there are fewer horses, or if they’re eating slowly, it could lead to leftover hay sitting in the bale feeder and possibly deteriorating when it comes into contact with the weather. If you’re interested in purchasing a livestock silage or hay feeder from our range, get in touch with the friendly team at Ace Equipment today. We can supply you with information on any product we have for sale and provide expert advice to help you choose the best option for your needs. Call us now on 0437 014 327 or submit an enquiry through our online form to receive a fast response.